A dozen or so white perch and the 4 lobsters in this photograph provided an extraordinary feast one summer at Jo Mary Lake Campground in Central Maine. 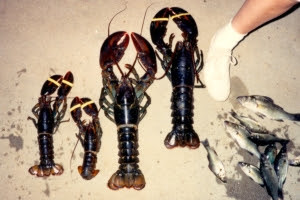 The fish look like minnows until you learn the smallest lobster in the picture is approximately 10 inches (25.4cm) long. The sneaker shown belongs to an adult helping put the size of the monster lobsters in perspective. The weak lobster chowder began with a pot of milk set to simmer, a few chunks of potato were added, and then salt and pepper. Finally for flavor, a wooden lobster that once hung at the entrance of the restaurant was held up to the light so the shadow would fall on the milk. My readers are welcome to identify corrections or the source, and if they’re still kicking I’ll link to their book, CD, or wooden lobster on this blog. In general I limit my content to true stories, but the lobster theme brought back memories of that wooden one, so I had to mention that choice piece of Maine humor.